"Chobe Safari Lodge -- Discover What Makes This Lodge a Favorite Among Many Tourists that Visit Kasane ..and the Chobe National Park"
If you are heading to Kasane for a safari (or business)...you might want to check out this lodge before you make a booking elsewhere. In fact, there are at least more than 100 reasons why you'd want to get your accommodation from this lodge. You have breathtaking views of the Chobe river from the dinning area (and from all the rooms)....because the lodge is located along the banks of the river. The lodge is reasonably priced (just our opinion)...here's why we think so: When you compare the standard of the rooms you get at Chobe safari lodge with those of other large lodges in Kasane...you'll notice that even though the rooms are pretty much up to the same standard...the prices at this lodge are much lower. If you're bringing the children along then you'll love the safari family rooms. These rooms have separate bedrooms with bunk beds for the kids. If you concerned about the safety of your valuable goods,…don’t despair because the luxury rooms are equipped with safes. So you can have the piece of mind of knowing that your laptops and other valuables are safe while your on safari. Speaking of safaris...the lodge can arrange game drives into the Chobe National Park ...as well as boat cruises on the Chobe River. 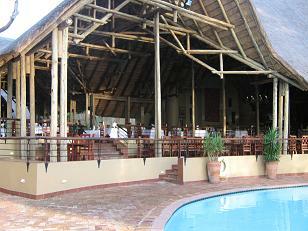 And if you want more...they also offer day trips to the Victoria falls and the famous Okavango delta. You can easily keep in touch with family through email, Skype and facebook since the lodge has hot spots in case you bring your laptop, ipad..and other devices you can use to access the internet. Even though you cant swim in the chobe river (unless you want to wrestle with the crocs :-) )....you should still bring your bathing suit along because there's a reasonably large pool just below the dining area of the lodge. For camping fanatics: Bring you camping gear along because Chobe safari has camping facilities offered at reasonable prices. The last time we checked, adults could camp for well below US$20...and about $11 for children. For the ladies: Let the highly trained staff of chobe...spoil you at their beauty and health salon. After a few days of sight seeing and safaris...the beauty and health salon at the Chobe Safari Lodge is the perfect place to go to unwind and get pampered. If you have never tasted local cuisine then you are in for a treat at the restaurant. The lodge serves breakfast, lunch and dinner...buffet style...and the variety of food will definitely leave you begging for more! They say a picture is worth a thousand words...but a video is worth a thousand pictures :-)...with that in mind, check out the video below to see the kind of adventure that awaits you when you book at the Chobe Safari Lodge. I could go on ...and on …with reasons why you might want to consider booking your accommodation at the Chobe Safari Lodge. There are many reasons why I think you'll love this place...but to get a complete picture of what they offer...or to contact the friendly staff at the lodge, visit their website which can be found at: www.chobesafarilodge.com .